Fission, also called binary fission, occurs in some invertebrate, multi-celled organisms. It is in some ways analogous to the process of binary fission of single-celled prokaryotic organisms. The term fission is applied to instances in which an organism appears to split itself into two parts and, if necessary, regenerate the missing parts of each new organism. For example, species of turbellarian flatworms commonly called the planarians, such as Dugesia dorotocephala, are able to separate their bodies into head and tail regions and then regenerate the missing half in each of the two new organisms. 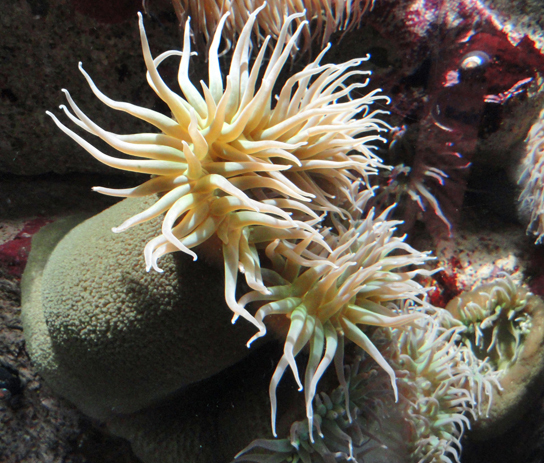 Sea anemones (Cnidaria), such as species of the genus Anthopleura ([link]), will divide along the oral-aboral axis, and sea cucumbers (Echinodermata) of the genus Holothuria, will divide into two halves across the oral-aboral axis and regenerate the other half in each of the resulting individuals. Budding is a form of asexual reproduction that results from the outgrowth of a part of the body leading to a separation of the “bud” from the original organism and the formation of two individuals, one smaller than the other. Budding occurs commonly in some invertebrate animals such as hydras and corals. In hydras, a bud forms that develops into an adult and breaks away from the main body ([link]). Fragmentation is the breaking of an individual into parts followed by regeneration. If the animal is capable of fragmentation, and the parts are big enough, a separate individual will regrow from each part. Fragmentation may occur through accidental damage, damage from predators, or as a natural form of reproduction. Reproduction through fragmentation is observed in sponges, some cnidarians, turbellarians, echinoderms, and annelids. In some sea stars, a new individual can be regenerated from a broken arm and a piece of the central disc. This sea star ([link]) is in the process of growing a complete sea star from an arm that has been cut off. Fisheries workers have been known to try to kill the sea stars eating their clam or oyster beds by cutting them in half and throwing them back into the ocean. Unfortunately for the workers, the two parts can each regenerate a new half, resulting in twice as many sea stars to prey upon the oysters and clams. Hermaphroditism occurs in animals in which one individual has both male and female reproductive systems. Invertebrates such as earthworms, slugs, tapeworms, and snails ([link]) are often hermaphroditic. 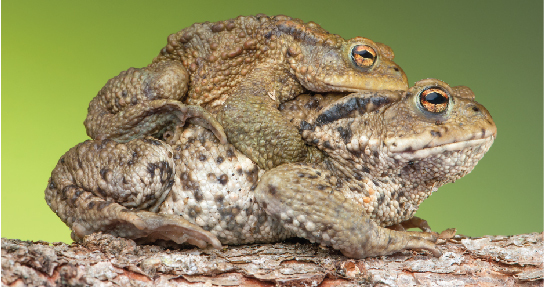 Hermaphrodites may self-fertilize, but typically they will mate with another of their species, fertilizing each other and both producing offspring. Self-fertilization is more common in animals that have limited mobility or are not motile, such as barnacles and clams. Many species have specific mechanisms in place to prevent self-fertilization, because it is an extreme form of inbreeding and usually produces less fit offspring. External fertilization usually occurs in aquatic environments where both eggs and sperm are released into the water. After the sperm reaches the egg, fertilization takes place. Most external fertilization happens during the process of spawning where one or several females release their eggs and the male(s) release sperm in the same area, at the same time. The spawning may be triggered by environmental signals, such as water temperature or the length of daylight. Nearly all fish spawn, as do crustaceans (such as crabs and shrimp), mollusks (such as oysters), squid, and echinoderms (such as sea urchins and sea cucumbers). Revise to "Frogs, corals, squid, and octopuses also spawn ([link]). Internal fertilization occurs most often in terrestrial animals, although some aquatic animals also use this method. Internal fertilization may occur by the male directly depositing sperm in the female during mating. It may also occur by the male depositing sperm in the environment, usually in a protective structure, which a female picks up to deposit the sperm in her reproductive tract. There are three ways that offspring are produced following internal fertilization. In oviparity, fertilized eggs are laid outside the female’s body and develop there, receiving nourishment from the yolk that is a part of the egg ([link]a). This occurs in some bony fish, some reptiles, a few cartilaginous fish, some amphibians, a few mammals, and all birds. Most non-avian reptiles and insects produce leathery eggs, while birds and some turtles produce eggs with high concentrations of calcium carbonate in the shell, making them hard. Chicken eggs are an example of a hard shell. The eggs of the egg-laying mammals such as the platypus and echidna are leathery. In ovoviparity, fertilized eggs are retained in the female, and the embryo obtains its nourishment from the egg’s yolk. The eggs are retained in the female’s body until they hatch inside of her, or she lays the eggs right before they hatch. This process helps protect the eggs until hatching. This occurs in some bony fish (like the platyfish Xiphophorus maculatus, [link]b), some sharks, lizards, some snakes (garter snake Thamnophis sirtalis), some vipers, and some invertebrate animals (Madagascar hissing cockroach Gromphadorhina portentosa). In viviparity the young are born alive. They obtain their nourishment from the female and are born in varying states of maturity. This occurs in most mammals ([link]c), some cartilaginous fish, and a few reptiles. If you use this textbook as a bibliographic reference, then you should cite it as follows: OpenStax College, Concepts of Biology. OpenStax CNX. http://cnx.org/contents/b3c1e1d2-839c-42b0-a314-e119a8aafbdd@12.1. If you redistribute this textbook in a print format, then you must include on every physical page the following attribution: "Download for free at http://cnx.org/contents/b3c1e1d2-839c-42b0-a314-e119a8aafbdd@12.1." If you redistribute part of this textbook, then you must retain in every digital format page view (including but not limited to EPUB, PDF, and HTML) and on every physical printed page the following attribution: "Download for free at http://cnx.org/contents/b3c1e1d2-839c-42b0-a314-e119a8aafbdd@12.1."